What happens when you get a team of storage professionals, engineers and technology experts together? 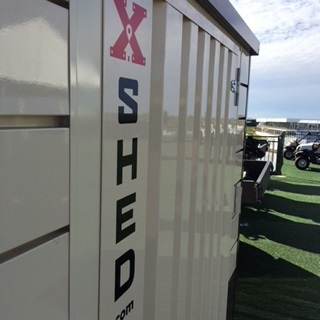 You create a company that understands the challenges of storage and utilizes powerful technology to give you an unparalleled experience…you get Xshed, the “On the Spot” storage solution. We’ve set out to change the storage game for everyone from the large construction contractor, to the restoration company, even down to the individual homeowner. We recognize that no two storage problems are the same, so we have designed sheds that work for your specific needs. After 3 years of innovation, we have built the perfect storage container that is mobile and can be set up anywhere, on any site, in just 15 minutes. The days of bulky, unsightly, big box containers that require a huge footprint are past. Xshed clients decide if they should put one on the fourth floor of the structure, inside a parking garage or under a patio in the backyard. And with the ability to connect our standard 13L X 7.5W X 7.5H Xsheds, you have unlimited options in designing the perfect size you need for your job. Ordering is easy with options to select an Xshed for delivery right from your phone or tablet. When your storage needs are complete, simply hit a button on your device and we will be there ASAP to pick up your shed.